I ventured back to Paramount’s early thirties factory this week. Pretty bleak place unless you’re shopping for silly melodramas or musicals that go thud. I know Lubitsch and Sternberg worked there, as did Fields and The Marx Brothers, but this was a mill churning out better than a feature per week, so exceptionally good product amounted to rare pearls among seas of dross. Still, I’m a chump for silly melodramas (It Begins as Romantically as "The Sheik," says the above ad) when they’re front-loaded with the likes of Gary Cooper, Tallulah Bankhead, Charles Laughton, and Cary Grant. Now there’s a cast for the precode ages. Did I mention it was ideally entitled Devil and The Deep? For years, you could barely see DATD short of a 16mm projector and purloined print. 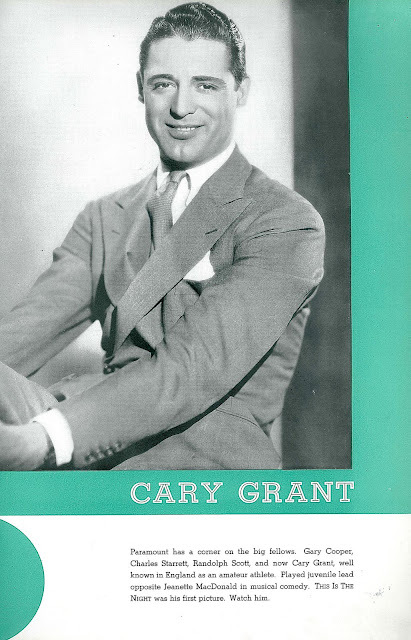 Now Universal is out with the 1932 release on DVD as one of three career starters Cary Grant had at Paramount. He’s the face on a box they’re selling, but Devil and the Deep is Cooper’s vehicle just as Fredric March takes most of center ring in The Eagle and The Hawk. Grant moves up to lead for The Last Outpost, even as he competes with miles of stock footage from desert skirmishes Paramount staged before talkies began. You just know CG had considerable talent to have withstood such onslaught of mediocrity. Disc sets like Universal's are an education for showing just what emerging personalities were up against during struggles upward, as well as revelation of how much was promised in those days and not delivered. Paramount like other majors sent out lavish product annuals to whet exhibitor appetites. Pages might as readily have been filled with soup cans and basted turkeys, difference being you had better chance taking delivery of those. Ever see Blood and Sand with Cary Grant and Tallulah Bankhead as forecast below? Or Fredric March and Claudette Colbert in A Farewell To Arms? Gary Cooper was artist-rendered with Sylvia Sidney for an upcoming Madame Butterfly, but it would be Grant assuming that role. In the end, few seemed to care a lick who played what in Paramount pictures, so long as talent spent no paid hours idle. 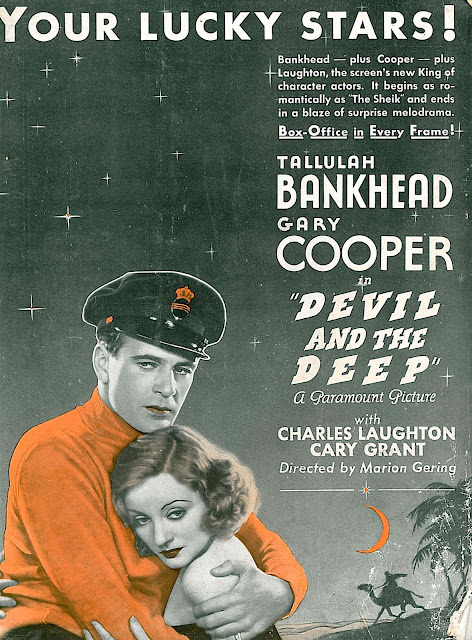 Devil and The Deep was for people who went to theatres without particular regard to what was playing. It more than fits the stereotype of dated old movies as modern viewers envision them. 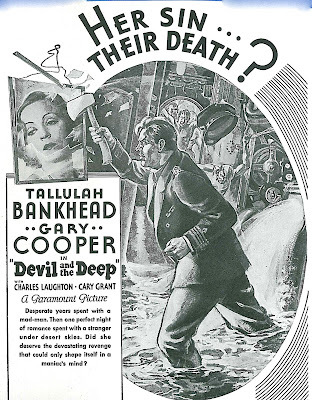 Paramount announced the film in April 1932 and had Devil and The Deep on screens by August. With so much merchandise to get out a year, they used/reused the same hammer and nails for all of what came off assembly lines. Mostly it was a matter of wedging stars into basic formulae. Here’s Devil and The Deep in shorthand … Insanely jealous husband on crippled submarine confronts wife and her lover … Simmer recipe for 78 minutes of running time, then release. Using toy subs and cardboard for characters, there was no better evidence to be had of heroic effort Golden Age luminaries put forth to make such absurdity credible. 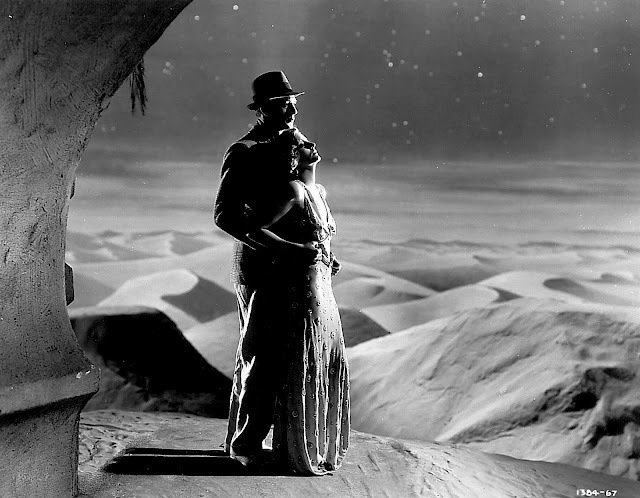 Paramount’s star system was built upon softest sand. You watch any of Clara Bow’s talkies and wish someone could airlift her out of there. Naming a Buddy Rogers vehicle is challenge enough, watching one all the more so. Warner’s talent raiding of William Powell and Kay Francis spoke volumes to commonplace vehicles they’d been given at Paramount and their anxiety to get away. Devil and The Deep would be a 100% drag minus newcomer Charles Laughton pitted against perfect specimens Cooper and Grant. He suspects both of seducing unlikely spouse Tallulah Bankhead. 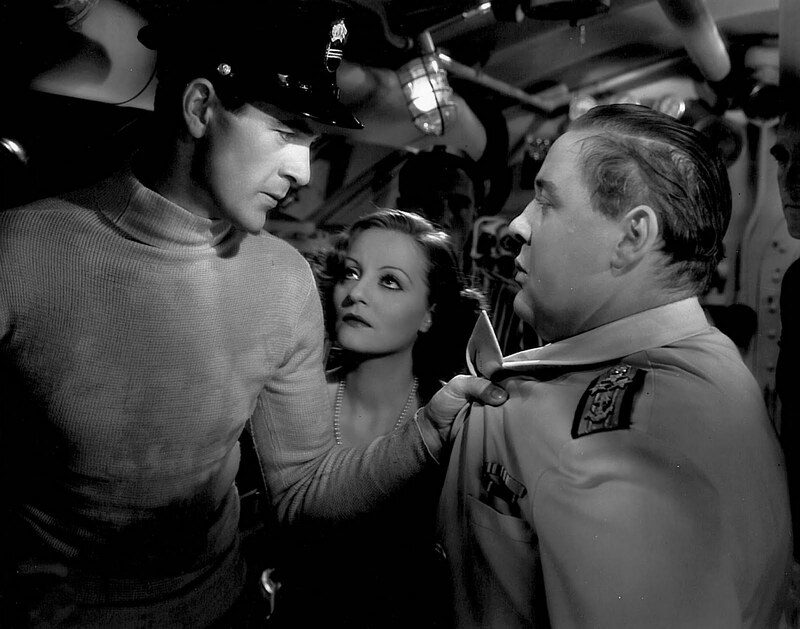 She’s jaded and willing as to Cooper, which leads to an outlandish submarine showdown wherein Laughton tries scuttling the craft out of jealous pique. The British actor was here making stateside debut (The Old Dark House filmed first but was withheld so that Paramount could "introduce" Laughton) and cast in accord with general Hollywood reaction to his unconventional features and disposition. What to do with that face other than render it loathsome or pathetic? For Devil and The Deep, they chose the former. CL’s only minutes in before slapping Bankhead across the face and thereby forfeiting audience sympathies. He’s an obnoxious bore no woman could love. Recognizing our awareness of this, the film includes dialogue where Bankhead refers to having married in gratitude for kindnesses shown her father, a not unfamiliar motivation for precode brides submitting to otherwise repellent mates. 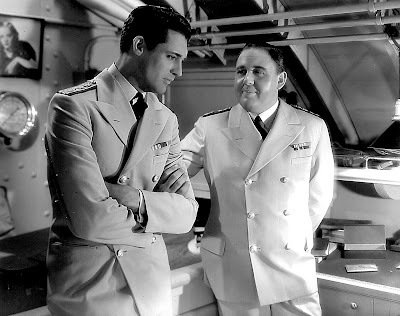 Laughton’s appreciation of said lacking goes past his character’s torment and becomes the actor’s own. He speaks the piece for all men who find themselves ugly and hate an attractive world for it. 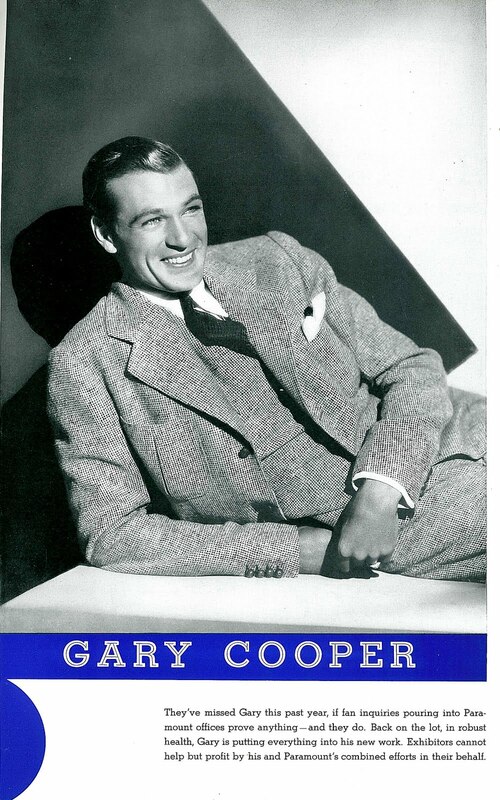 Crueler still is having Gary Cooper, here at his masculine idol summit, as instrument of cuckoldry. Must be a happy thing to look as you do, says Laughton to his usurper, I suppose women love you. It must be a happy thing. We feel a kind of agony watching this actor express his. 30’s viewers unaccustomed to such naked confession of physical inadequacy must have found Laughton a new and startling departure from Hollywood type, though it wouldn’t be long before that unique persona was applied to costume villainy comfortably removed from modern setting. Laughton received lots of 1932 press for his practical knowledge of psychology as reflected in disturbed figures he played. I like to shade my portrayals on the side of repression, the actor said, at least until the climactic moments of the play arrive. Stops were then pulled for Laughton breakdowns that became an expected highlight. I’ve always had a particular fear of overacting, he remarked, though at least for initial years, no one pointed fingers (that would come later). Devil and The Deep was notable for inspiring histrionic gestures beyond the call of duty. Gary Cooper performs in inverse proportion to Laughton for what amounts to a contest of styles, one that CL graciously conceded to screen-trained Cooper, the latter's naturalness being a quality Laughton frankly envied. 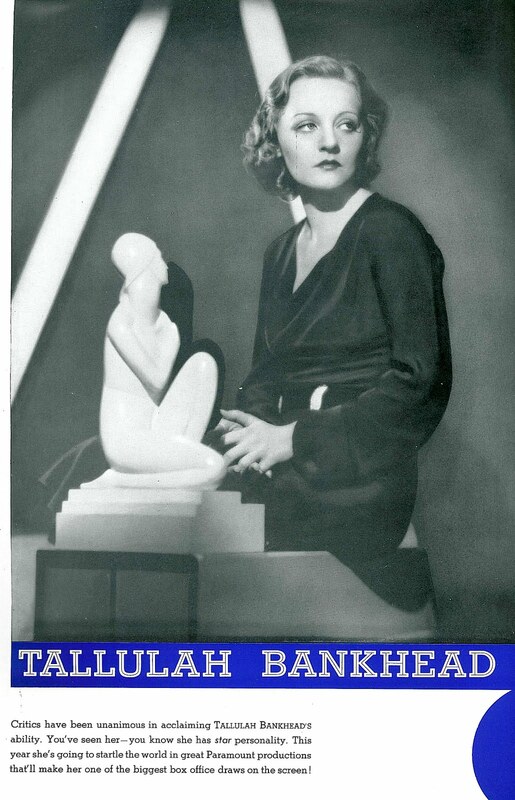 As to Bankhead, she was a Dietrich model we weren’t buying that year, despite ability at least equal to Marlene’s. The Cheat on DVD and now Devil and the Deep confirm her effectiveness. 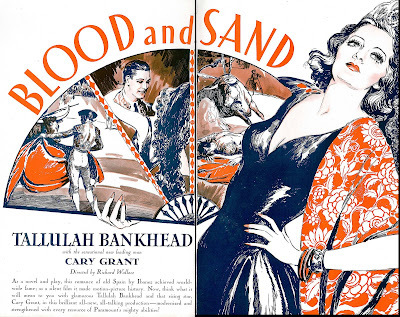 Was it a remote quality and distancing from movie audiences that precluded their embrace of Bankhead as precode ID figure? My own memory of her is clouded by a harrowing sit through Die, Die, My Darling, one of 1965’s more unpleasant afternoons at the Liberty (I’m to this present day suppressing imagery of Tallulah chasing Stephanie Powers with long knives). Devil and The Deep was directed by one Marion Gering. Would it have been a better picture under Josef von Sternberg’s supervision? Certainly he’d have had more Paramount leeway and a higher budget. Consider the $851,000 spent on his Shanghai Express as opposed to $481,000 invested in Devil and The Deep (but then Shanghai earned $827,000 in domestic rentals to Devil’s $415,000). There was very much a director’s caste system in place at Paramount. 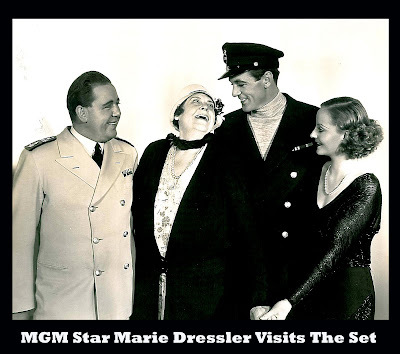 Lubitsch and Sternberg got monies they needed to do shows right, while the Marion Gerings took short change to finish as best they could off the rack merchandise like Devil and The Deep. I really have enjoyed your blog for a while now, but I have a confession. Your layout drives me bonkers. But when I persevere, I'm always glad. This much too good to not be read because of such a silly thing. I was glad to see the CG boxed set. I have all these movies in various dubs and bootlegs, but its nice to see them get proper treatment. I quite like Eagle and the Hawk even though it's March's movie, as you say. Last Outpost is just plain fun. Maybe it's been helped by all the poor copies I've viewed over the years--the stock footage is less noticeable. And it remains Cary's one and only foray into the realm of mustaches. Devil and the Deep has really grown on me in the last few years. I love the image you've posted of Coop and Tallulah at the oasis. I admit to enjoying the absurd, only in the movies, quality of their love scenes. I think Cooper was better paired with Bankhead than Dietrich, Morocco and Desire are better films. Maybe Bankhead was too similar to Dietrich in looks, but lacked the singing and androgene gimmicks which set Dietrich apart. Your insights into Paramount at this time are spot on. After reading this, I can see why a lot of stage trained British actors who were lured to Hollywood in the early thirties decided to go home again. Grant and Laughton were exceptions and we're lucky they managed to slog through a lot of the junk they were given. Haven't checked for subtitles, but I'd imagine it has them. Sorry about the layout, Jenny, though it varies from one person's screen to another. The page always looks fine on my computer and others I check from time to time, but there are those who have had problems, I know. There probably isn't an ideal solution for this, unfortunately. I like the other two Cary Grants in the box as well. Maybe I'll get around to doing a follow-up post covering them sometime, as I do have some good stills on "Eagle" and "Outpost." Laughton envied Cooper's style? Wow. I've always found Laughton riveting and Cooper an utter bore. John: I think early 1930s Paramount was a pretty swell place to be, in fact, probably the best studio after my beloved Warner Bros.
Just consider a few of Paramoun's gems released in 1932, the same year as "Devil and the Deep." There's "The Big Broadcast", "Dr. Jekyll and Mr. Hyde", "Love Me Tonight", "Trouble in Paradise", "Million Dollar Legs", One Hour with You", "The Sign of the Cross", etc. Like you said, Lubitsch and Von Sternberg were there, and so was DeMille. The studio boasted W.C. Fields, the Marx Brothers and Mae West. Even their programmers have that special sheen and polish that graced even their B movies. Their comedies have an anarchic spirit that would not have been permitted at other studios, and with Bob Hope and Preston Sturges to come, I think Paramount was to comedy what horror was to Universal, musicals to M-G-M and gangsters to Warner Bros. I've got a feeling that had the Marx Bros. been able to stay at Paramount, they'd have been shunted into the kind of silly films that they put Burns and Allen in around 1935. Kevin, of course they made some amazing movies there, but the vast majority wasn't terribly memorable. In Grant's years with the studio he was making 6 pictures a year and all except She Done Him Wrong and maybe 30 Day Princess are of the same rank and quality as the offerings in this box set. it wasn't just that he was the newcomer and expected to pay his dues by working through this lower grade material. Bonafide star Gary Cooper made fewer and better pictures, but he was still given quite a lot of stuff like Devil and the Deep. An excellent indictment of Paramount in the early thirties, a studio that made plenty of excellent films (e.g., the Lubitsch musicals, early Marx Brothers, "million Dollar Legs") but for all purposes was less than the sum of its parts...especially considering its huge roster of talent. As a Carole Lombard fan, I've often mentally played "what if," and one of those historical revisions centers on how her career might have been different had she signed with a studio other than Paramount in 1930. Fox wanted her for the lone female role in "The Sea Wolf," by which time she was already committed to Paramount's "Safety In Numbers," but given Fox's rapid decline in the early '30s, that might actually have been a worse home for her than Paramount. At MGM, she probably wouldn't have been able to find her niche, either. Universal probably wouldn't have known what to do with her, and RKO wasn't really an option since it was largely a new-generation Pathe, where she'd been fired in late 1929 for too closely resembling Constance Bennett. Carole could have worked with Jame Cagney in "Taxi!" or "Hard To Handle," but rejected the former -- a move she later regretted -- and couldn't fit the latter into her schedule. Too bad, because Cagney's energy might have elicited the Lombard we know and love before John Barrymore did in "Twentieth Century" (another non-Paramount). I think with your statement "...Paramount’s early thirties factory...Pretty bleak place unless you’re shopping for silly melodramas or musicals that go thud..." you sold Paramount short. Sure there were misfires, but Paramount was known for comedy and light musicals-especially the Bing Crosby musicals. 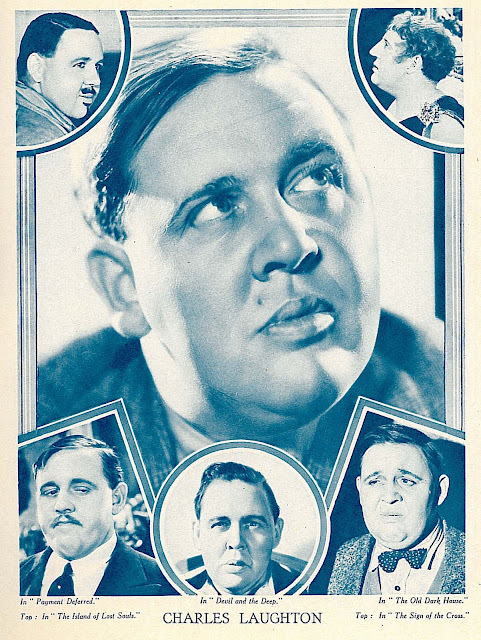 Crossby is semi-forgotten today, but was not only a huge recording star but huge movie star and he made some great, unrated films in the 1930s. I have been chomping at the bit for a week now to comment on this. I agree with some of the other commentators on Paramount in the early-mid thirties in general and many of the films specifically. They were really an interesting anomaly among the majors in that policy (if indeed there was one) seemed to shift from week to week. What other studio could have given us "Trouble In Paradis", "Duck Soup", "I'm No Angel" and "International House" all within such a short time? AND, I will add "Devil and the Deep". Aww, c'mon, John, how can one NOT love this film? It's so wonderfully over the top in every department! I will also clarify the fact that my familarity with this stems from many welcome late-night viewings here in L.A. on the old "Movies Till Dawn" on local station channel 5, then owned by Gene Autry. They ran tons of great Paramounts in the wee hours, like this one. Glad too, you quoted Laughton's flavorsome line, "Must be a happy thing to look like you". But my favorite dialogue in the film was when Dorothy Christie, in gossiping about La Bankhead's roving-eye to an interested group, says, "If you were my wife I'd give you a good spanking!" To which Tallulah retorts, "I'm sure few things would give you greater pleasure!" (And you don't love this film? I'm unhappy -- well, disappointed). And, to the gentleman who listed some random Paramount titles, I would like to add: "Mississippi" and "Hands Across The Table", both from '35. All best, as always, John. R.J. I really like "Devil and The Deep", RJ. Always have. Also a lot of other Paramounts from the 30's that you mentioned. There's really very little from that early 30's period I don't enjoy, even some of the really early Paramount talkies like "Interference" and "Charming Sinners" are interesting to watch. Guess for purposes of the article, I'm talking more about their general reputations and the fact they are routine, studio product, which for folks like us is always a good thing. I've seen THE DEVIL AND THE DEEP only once . . . years ago on late night television back in the 1980s. I thought it was a rather bizarre movie. However, I wouldn't mind seeing it again. I believe that eventually happened to them at MGM, following one or two hits.